Our sweet Teddie arrived on October 26, 2005, the only girl in two litters out of Andie, and a beautiful multiple Best In Show dog, Bear. So many things about Teddie made her special...she knocked out a lower front tooth as a young dog, jumping fences. Because of this, we never showed her and called her our "hillbilly girl". She would "smile" at us when asked, "what did you do Teddie?". This sometimes frightened puppy buyers until they realized what she was doing. She loved being a mama, and was miserable when Andie or Piper had babies...and she didn't. 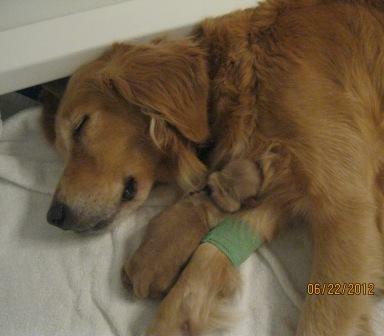 She was a mother to 38 puppies, and those families will be changed forever because of her. On the morning of June 22, 2013, we were vacationing in Mexico when I received a facebook message from my sister-in-law. It simply stated that Teddie had passed away. I called the dog-sitter to find out the details, then pieced together the horrible last night. Teddie hadn't been secured in her crate and at some point escaped. She raided the pantry, eating popcorn kernels and brown sugar. Unfortunately she found the dark chocolate bars that had been forgotten on the counter...they were meant to go with us. She consumed three and a half of them...about 10 ounces...a toxic level. When the sitter arrived Saturday morning, Teddie was hyper and needed to go out. Not knowing what had happened, she let her out with the other dogs. Teddie was later found in the yard, unresponsive. The Necropsy showed toxic ingestion with secondary cardiac failure. Our hearts are forever broken as nothing will bring back our sweet Teddie.